Simply the best circular polisher on the market today. The FLEX LK603VVB Circular Polisher combines the best features of the Makita 9227 and the DeWalt 849 into one sophisticated rotary polisher. The German-made FLEX LK603VVB Circular Polisher is a professional quality, 10 amp car buffer that delivers consistent, smooth performance in a user-friendly package. In the tradition of P21S, Klasse, and Menzerna, the FLEX LK603VVB Circular Polisher is another brilliant product from Germany. 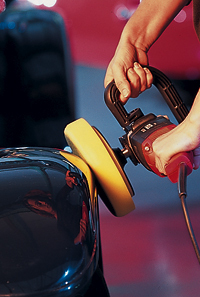 You’ve seen what German ingenuity does for car care products; now you can see what German ingenuity does for a car polisher. Like the Makita, the FLEX LK603VVB Circular Polisher is a powerful 10 amp polisher. Like the DeWalt, the FLEX has rugged, professional grade construction. Plus, the FLEX LK603VVB Circular Polisher has an array of features that put it in a league all its own. Many European car makers use the FLEX LK603VVB Circular Polisher in their plants because of its professional grade construction and dependable performance. We’re sure you’ll agree: The FLEX LK603VVB is one impressive polisher! The FLEX LK603VVB Circular Polisher operates from 1000-3000 rpm with an accelerator trigger switch to adjust the speed with your fingertip. You’ll experience consistent speed control by tachometer generator, which gives you smooth, uniform results. To further ensure your detailing success, the FLEX LK603VVB Circular Polisher features overload protection. In the case of excessive load, the tension spring will be completely released, stopping the machine from overheating. Polish with precision with the FLEX LK603VVB Circular Polisher. 6 = 3000 rpm Since rotary polishers are well-suited for serious compounding, the FLEX LK603VVB Circular Polisher features integrated air deflection, which protects the machine against dust. FLEX Longlife™ shut-off carbon brushes protect the motor by shutting off when the brushes wear down. In every way, FLEX has anticipated the needs of the end user and built the LK603VVB accordingly. The FLEX LK603VVB Circular Polisher weighs less than 8 lbs and has a comfortable bale handle to minimize fatigue over long periods of use. Balancing the polisher is easy with the bulk of the machine being centered under the bale handle. The handle can be offset to the right or left side, depending on your preference. The FLEX LK603VVB Circular Polisher is the most user-friendly and intuitive rotary polisher on the market! The speed control, the soft start trigger, the auto off carbon brushes, overload protection – FLEX thought of everything when they designed the FLEX LK603VVB Circular Polisher. The smooth, dependable operation gives you the ability to remove swirls and scratches, polish out oxidation, and restore a flawless finish to your vehicle.